Set on the largest bend of the Grand Canal, Ca’ Foscari was built by Bartolomeo Bon for the controversially ambitious Doge Francesco Foscari in 1437, the same who had himself proudly portrayed on the Porta della Carta, the main entrance to the Palazzo Ducale. One of the last great Gothic palaces built in Venice, Ca' Foscari is the same florid style as the Palazzo Ducale, and it has the largest private courtyard in Venice. It wasn't enough to cheer up the Doge; not long after having been dismissed from office, he retired here and died of a broken heart. It was still thought one of the city’s finest palaces in the late Renaissance; Venice put up King Henry III of France here on his memorable visit in 1573. 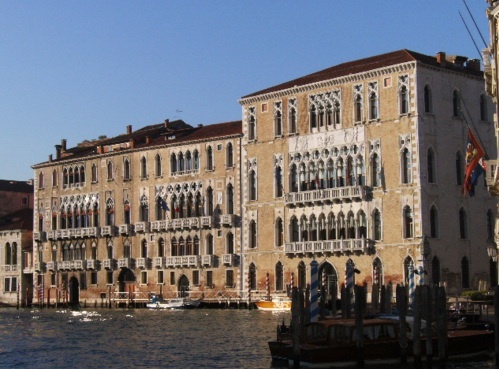 Since 1868, it has housed the Università Ca' Foscari Venezia. In 1936 and 1956, Carlo Scarpa reworked much of the interior, and designed the great 'Aula Baratto' hall. In 2013, after extensive renovations, the palace became the oldest building in the world to earn the LEED certificate for sustainability. Next to it, Bartolomeo Bon’s Palazzo Giustiniani (1452), was built for the family that traced its origins back to Byzantine Emperor Justinian; palace-hopping Richard Wagner spent some time here in 1859, while he was working on Tristan und Isolde. Today it's also part of the university.